I just got back home today and now that I’ve had a chance to list all the accessories that I was carrying with me during my trip to San Francisco I thought that I should also cover the software side of things. When you’re away from home whether it is for business or holidays you will obviously be eating out pretty much all the time and finding a restaurant to suit your tastes or a particular occasion will feature high on the agenda. Vindigo ($24.95/Year) is a service that works well in this context not only to find locations (I had over 1,500 choose from) but also to ‘save and/or rate’ restaurants that you’ve already been to or that friends or colleagues may have recommended. My favourite, trusted and recently updated Treo alarm featuring MP3 playback was absolutely essential to get me awake and out of bed in the morning after the many late nights in SF… Since I’m not a morning person the fact that I can use Bob’s Alarm ($9.50) to wake up to my favourite tunes instead of some deafening beeping sound makes a huge difference to my early mood. 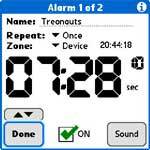 Additionally, I have found it to be by far the easiest to setup – particularly if you will be waking up at a different time every morning. I can’t say that I made extensive use of this functionality but on a couple of occasions it was useful to find the number and location of a store when I had gotten lost. I tested two applications: Handmark Express ($69.99/Year) and InfoMan ($39.99/Year). The great thing about Express’ application is that you can do a business search and then either save the full details in your contacts, dial the number or download a map of its location. However, it uses up to 2MB of memory… InfoMan provides the same data without the maps but I found this to be a terrific, well designed and extremely easy to use application. The alternative to these – albeit a slightly slower one – is Google local (www.google.com/local) or Google SMS (www.google.com/sms) [Thanks Dan]. Doing the mental arithmetic when the rate of exchange or amount are rounded numbers is easy but I made more than a few mistakes by not using the easy currency converter that comes built-in to InfoMan… This version is particularly good because in sharp contrast to WorldMate’s, for example, the ‘amount’ is always highlighted and ready to be changed which saves a few otherwise painful ‘usability’ seconds. InfoMan’s complete list of world currencies will undoubtedly prove useful again in the future. There are about a dozen applications that provide weather information on your Treo and I have yet to find a single one that I consider to be perfect or even near that. While I keep looking, InfoMan’s summary and detailed weather information is more than adequate. Two things that were missing from my travel application kit were a GPS solution which I would really like to add shortly and also a simple ‘packing list’ for my Treo to replace the one that I currently have in an MS Word document and which I typically print out and tick before leaving. UPDATE2: Thanks Aaron for sharing his experience with the Navman Wireless Bluetooth GPS solution ($161) which apparently has worked very well for him. I will definitely evaluate this GPS unit in the next couple of weeks along with similar ones from TomTom, Garmin (last two not yet released) and EMTAC. UPDATE3: At long last I have now finally also been able to experience and review the fabulous benefits of using a GPS solution with my Treo – absolutely amazing. Have you tried Worldmate? It is great for traveling and includes a nice packing list as well as weather functionality. It has been bundled with devices from time-to-time. The basic version is a good buy, the Pro version adds things that you may not need. Thanks Dan - yes, I actually have WorldMate installed as well but while it is certainly 'pretty' from a design perspective I found it to be lacking in functionality and usability. For your packing list, you might try Bonsai or Splash Shopper. Either one on of these could be set up as a simple checklist and fairly easily with the desktop conduit. I have been using Bonsai until recently when I figured I could integrate my "packing list" in Splash Shopper with a "items needed to buy" list for travel. Hope you enjoyed my fair city! 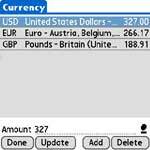 I've used HandiShopper for my travel list for years. But the dest top intergration of SplashShopper has been winning over more and more of my lists! 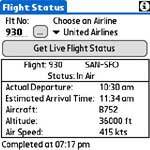 You didn't mention if you have flew during your travels, but if you did, an app I find indispensable is FlightStatus. It can be found at www.AndrewSoft.net and all that is asked for is a small donation to the authors college fund. Not only does it tell you the estimated arrival and departure times of your flights, but if the aircraft is still in the air, it even tells altitude and airspeed. My personal findings are that it is actually more accurate than the monitors found in most airports. I recently picked up the Navman GPS software for my wife's T3. Very cheap on Amazon (search for the incredibly long title: "Navman GPS 4460 Wireless Bluetooth GPS Receiver with SmartST Navigation Software for PalmOS 5.0 Handhelds"). The GPS receiver is BT so it works with any Palm OS 5 deivce that supports it. The downside is that only 1 handheld at a time can utilize the software due to some license key. No biggie for you though, since it would just be your 650. Comes with a car kit (suction cup windshield cradle), AC adapter and a USB card reader! The receiver takes AAA batteries which is a HUGE bonus. No more worrying about charging the receiver. Just keep spare batteries in the glove compartment. does the navman work in america? Thanks Jason & Roger: I actually have SplashShopper installed but hadn't thought about using this for my packing list... I'll definitely give it a go. Thanks Michael - I had noticed that the weather was in Vindigo but the issue that I have when I travel is that I don't Hotsync that often so I like having a separate app that I can update over the air. Aaron - NavMan, EMTAC and TomTom GPS units are definitely next on my evaluation list and I hope to be able to review them in a couple of weeks time. Howard - Thanks, ThoughtManager and ListPro have been among my favourite apps for a while. 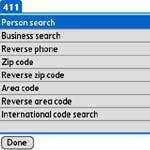 Re InfoMan 411: The best alternative to these costly services is not google local, it's google sms (www.google.com/sms). 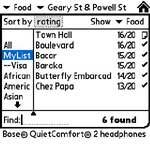 It has served me quite well and gives you the option to pull up a map (MapQuest) using the internal browser, dial the number directly or copy it to the address book, or use Address book entries as search criteria and directions. And it is only 92 k in size. Thanks Aaron2 - I like Digital Assistant a lot too but I have found that the results that it provides are much less accurate than those of InfoMan and Handmark Express. Albeit, it is a free option which the two others are not. I found the freeware program Metro very handy in getting around on the Paris public transit. There is a huge list of covered cities worldwide, including major US metropolitan areas. Yes, the Navman works in America. The GPS review site I linked to is a UK site that's all. I like thier reviews though. I live in New York and have had no problems with the Navman through NY and New Jersey so far. The software comes with 4 discs of maps. Every state is broken down into regions (Southern New York, Northern, etc). I use HandyShopper for my travel packing lists and I'm quite happy with it.